Enza Gandolfo’s second novel has been many years in the making, but it has been well worth the wait. This is an ambitious, multi-generational story from a skilled writer. Diving into the almost four-hundred-page novel, I was promptly absorbed by its carefully layered plot, its significant cast of troubled characters, and Gandolfo’s strong loyalty to a representation of recent local history that takes in the union movement, post-war European migration to the city of Melbourne, and the very real struggles of raising a family, both with and without the support of extended family. 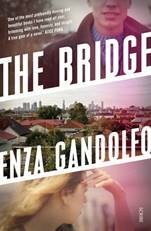 The novel opens with scenes of suburban Footscray circa 1970, taking in the expansive open air workplace of the West Gate Bridge under construction, its riggers and other labourers toiling together on an ambitious civil project that has about it a sense of the heroic, flecked through with hopes of progress, growth, and prosperity. We are drawn quickly into the world of Antonello, a rigger, and his wife, a school teacher, newly married and deeply in love, and a new-migrant community in which everyone lives and works within the same small footprint. Anotello is also a talented illustrator, and his regular hobby of sketching scenes along the banks of the Yarra hints at a character capable of subtle and artful perception. When disaster strikes and the Westgate construction site collapses, killing and injuring many of its workers, the children and teachers at the school are within earshot, and Gandolfo’s deeply affecting portrayal of a scene in which the family members wait many hours on the fringes of the large-scale accident for their loved ones to appear from the wreckage is a tour-de-force: an early downpayment on the full emotional weight of the novel as a whole. Footscray is a lovingly drawn and important character in this book. Gandolfo’s evocation of place reminded me of Tony Birch’s representation of Collingwood and the inner north of Melbourne in Ghost River (Birch 2015), set in part at a similar time. Both novelists, in showing us the city’s very recent but no longer entirely visible past, gift us with a form of knowledge difficult to unearth via other forms of narrative. Both also contribute to the long-standing Australian tradition of working class, social-realist fiction. Here are layered, complex, and intelligent representations of a diverse array of characters, deeply shaped by the neighbourhoods from which they have emerged. Antonello, one of the book’s most interesting characters, grows from young man into elderly patriarch over the course of the novel. A reluctant survivor, he is irrevocably changed by the tragedy of the West Gate Bridge accident in which several of his closest workmates were killed. After the event, he withdraws emotionally from everybody he loves and gives up his art practice, too. It is only in old age, forty years later, when confronted by the book’s second major tragedy, that he begins to recognise the mistakes he has made through failing to forgive himself for surviving. ‘“Don’t shut down,” he advises his adult son, in the face of his new, hard-won wisdom. “If you shut down, everything will get worse”’ (346). Antonello is an intriguing and complex portrait of human grief, from a mature writer who understands, compassionately, something of what is at stake for a masculine hero in the face of formidable failure. A second key tragedy occurs in The Bridge, set in precisely the same neighbourhood, almost forty years later, in 2009. This incident changes things markedly for eighteen-year-old Jo, her mother Mandy, and their hastily appointed legal-aid lawyer Sarah. For me, in contrast to Antonello and his self-imposed isolation, these three women are like a strong braid. They are often uncomfortable in one another’s company, and yet there is a collective strength to their bond, even in the face of one another’s anger, criticisms, absences or betrayals. Gandolfo illustrates in and through each of these women both the burden and the consequence of anxiety and self-hatred, and something of the manner in which women’s friendships can turn, for good or bad, on the most subtle of actions. There is something about each of these women that has them cast out of the mainstream, and judged harshly for it. They need all their wits and inner resources to pull through. But they will pull through: Gandolfo makes sure of it. These are women with courage, skillfully represented and powerfully present for the reader. The novel takes readers through some difficult emotional terrain, and Gandolfo presents each and every conflict with characteristic generosity, enabled in part by the technique of multiple implied narrators. She has constructed a compelling plot, but also dwells carefully on the complexities and contradictions created by that plot, compelling us to face our own assumptions and prejudices about the choices people make in circumstances limited both by structural disempowerment and by privately-held anxieties and regrets. Gandolfo will be known to many TEXT readers as a former editor of this journal, and she wrote much of The Bridge while teaching full time in the writing program at Victoria University. I hope we’ll see more of her work as a novelist in the years to come. Julienne van Loon is an award-winning novelist. Since 2015, she has held the position of Vice-Chancellor’s Senior Research Fellow with non/fictionLab at RMIT University. She is co-editor at TEXT and an Honorary Fellow in Writing at the University of Iowa. Julienne’s first non-fiction book, The Thinking Woman, is forthcoming with New South in 2019.